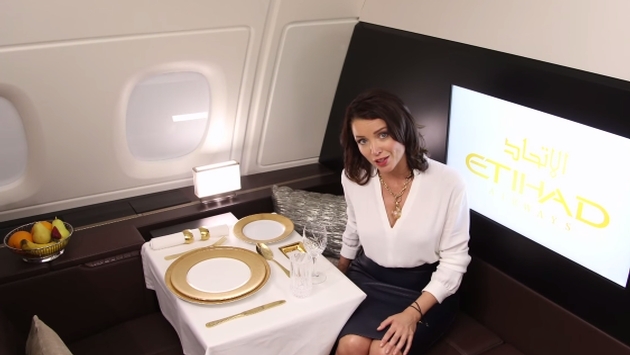 Etihad Airways announced in May that it would bring the comfort of a tiny apartment to the skies with its Residence suite. Those with the means went mad for the idea, because the rooms priced at $20,000 have sold out. Bloomberg’s Deena Kamel Yousef reports the three-room suites, complete with a bathroom and butler service, have been fully booked for the first 10 flights to offer the accommodations. To the CEO’s credit, there is most certainly a market for the apartments, which incidentally come with butlers who were trained at the Savoy Butler Academy in London, via a press release. The airline is hoping remarkable accommodations will draw a certain demographic away from competitors like Emirates of Dubai. If the news of complete bookings is any indication, there are those who are more than willing to fork over a sizable amount of money for a wholly unique experience. As for the initial throes for the truly luxurious, Yousef writes, “Etihad’s first A380 will fly between the No. 3 Gulf carrier’s Abu Dhabi base and London from Dec. 27.” For the extremely wealthy, that post-holiday hangover will be mended in the highest fashion currently offered by an airline.